Whether going across town to high school or across the country to college, you want your vehicle to be in top working order. Before school starts, make a point of performing maintenance or having your car, truck or SUV inspected at Kia of Downtown Los Angeles. 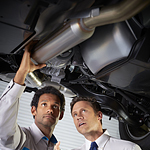 Take care of the basic maintenance needs that include an oil change and tire checks. Rotate or replace the tires if needed. Evaluate the brake, coolant and transmission fluids and fill them as needed. Check the condition of the windshield wiper blades, which are inexpensive and easy to replace. Get prepared before bad weather or an emergency strikes. Make sure to have jumper cables on hand. Pack a flashlight, windshield washer fluid and perhaps a pair of gloves. A first aid kit, bottled water and survival snacks are also recommended along with a blanket, ice scrapers and a small shovel.